This recipe is my interpretation of an appetizer that has become a classic at my sister’s house. After the meatiness of the scallops & bacon, and the buttery richness of the phyllo-wrapped figs, I wanted a third appetizer that would be bright and refreshing, with a good hit of acid. My sister texted me the ingredient list, and here’s my take on assembling it all. I was lax in taking a photo, so until I make them again and can add a pic, you’ll just have to use your imagination, I’m afraid. A few shopping tips: if you can’t find endive at your local supermarket, they can usually be found at Trader Joe’s. For the balsamic, you’ll want to use a good one since it’s such a major ingredient. I’m currently using this one from O & Co., which has a lovely syrupy texture and mildly sweet undertones. Next time I’d like to try making these using my secret weapon, Blaze, a balsamic reduction and key ingredient in my tomato, basil, mozzarella sandwiches. If anyone has more balsamic recommendations, leave them in the comments below! Rinse endives, separate the leaves. Halve grape tomatoes. Place three grape tomatoes in each endive leaf (use your discretion as to how many to make; the smaller inner leaves will not be sufficient to hold the tomatoes). Sprinkle with basil leaves. Drizzle each endive “boat” with olive oil and balsamic. Finish with freshly ground sea salt and pepper. Serve as finger food with a cocktail napkin. While my guests were happily munching on their scallops, I popped these suckers in the oven to cook, having assembled them earlier on that day. I have to admit — not only did these taste good, but they were a lot of fun to make. 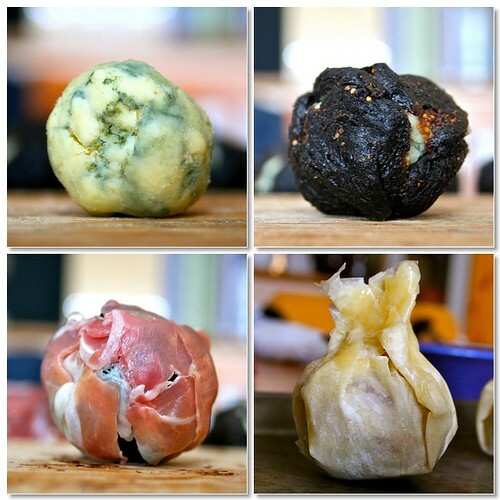 While it would be a bit of a stretch to refer to these as “unfussy,” there’s a certain amount of freedom in forming them…rolling blue cheese into balls with your (clean!) bare hands, halving the figs and affixing them as best you can around the cheese (gaps are expected), then enveloping the package with a blanket of delicate cured meat… It actually brought me back to being a kid and working with play-doh. For a perfectionist like myself, it’s an absolutely freeing and playful process. The end result? Pure satisfaction. Form 2 teaspoons cheese into 1-inch-long log. Place 4 dried figs around cheese and press gently to adhere. Wrap 1 prosciutto strip around fig bundle. 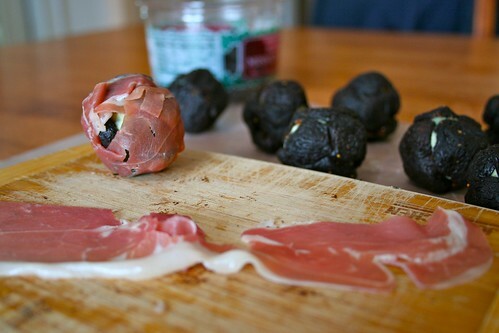 Repeat with remaining cheese, figs, and prosciutto. Place 1 phyllo sheet on work surface (keep remaining phyllo covered with plastic wrap and damp towel). Brush phyllo lightly with melted butter. Top with second phyllo sheet; brush with butter. Repeat with 2 more phyllo sheets. Cut stacked phyllo sheets into four 6-inch squares (discard phyllo trimmings). Place 1 fig bundle in center of 1 phyllo square stack. Bring all edges of phyllo square up toward center and squeeze firmly at top, forming pouch and enclosing fig bundle completely. Place on baking sheet. 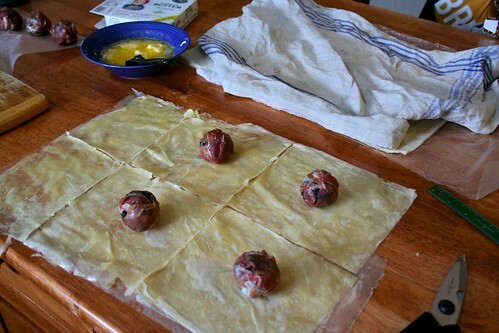 Repeat with remaining phyllo sheets, melted butter, and fig bundles, forming a total of 8 pouches. Brush outside of phyllo pouches with remaining melted butter. Can be made 6 hours ahead. Cover and refrigerate. Preheat oven to 375°F. 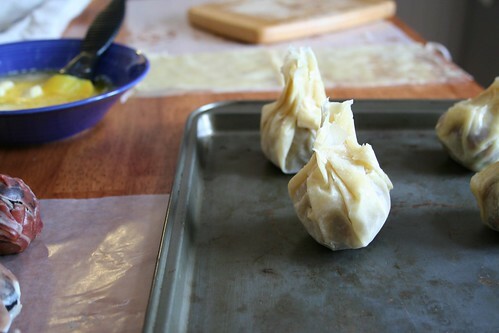 Bake pouches until golden, about 17 minutes. Meanwhile, bring Port, balsamic vinegar, and sugar to boil in medium saucepan. Boil until mixture is reduced to ¼ cup, about 15 minutes. While Port mixture is being reduced, boil cream and pine nuts in another medium saucepan until reduced to 1 cup, about 8 minutes. Remove cream sauce from heat; season sauce to taste with salt and pepper. Spoon 2 tablespoons cream sauce onto each of 8 plates. Place 1 phyllo pouch atop sauce. Drizzle each lightly with Port sauce and serve. I admittedly went a little overboard with the butter on this one. It doesn’t need it. I still didn’t use the full amount called for in the ingredients list, so keep that in mind. I think the key part of the directions is where it says “Brush phyllo lightly with melted butter.” Certainly you need to use a light hand so as not to tear the dough. But it applies to the amount of butter as well. If making the sea scallops as well, feel free to use the Port wine reduction from that recipe for both appetizers — no need to make two versions. Although I must say, the addition of balsamic vinegar in this version is a nice complement to the blue cheese. …or, according to my handwritten notes on the printout of this recipe, “Rock star scallops! 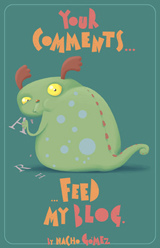 BEST RECIPE!” I first came across this recipe when searching for a special appetizer to make for my sister’s elopement. Enter the recipe below. It made the cut — and an impression — and I’ve been dying for an excuse to make them ever since. Plus Mr. Manly likes them. Clearly a no-brainer start to our fancy New Year’s Eve dinner. Cooking tips are included at the end. Bring Port, superfine sugar, peppercorns, and mint to a simmer in a 2-quart saucepan over moderately low heat, stirring until sugar is dissolved. Remove from heat, then carefully ignite Port with a kitchen match, letting flames die down (this will take a few minutes). Simmer over moderately low heat until sauce is thickened and reduced to about ½ cup, about 15 minutes. Transfer to a bowl and cool to warm. May be made 1 day ahead and chilled, covered. Reheat before serving. Heat a 12-inch heavy skillet over moderate heat, then cook bacon until some fat has rendered and edges of bacon start to brown, about 1½ minutes per side. Transfer bacon to paper towels to drain. Pat scallops dry and season with salt and pepper. When bacon is cool enough to handle, wrap a piece of bacon around each scallop and pierce scallop with a wooden pick to secure. 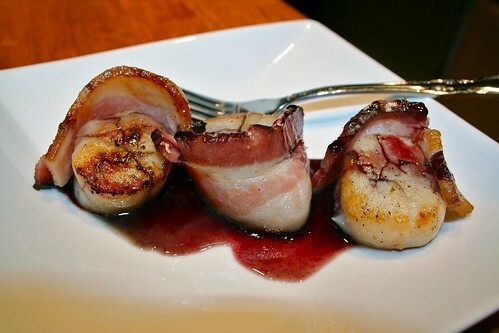 Scallops may be wrapped in bacon, but not sautéed, 4 hours ahead and chilled, covered. Sauté just before serving. Heat oil and butter in cleaned skillet over moderately high heat until hot but not smoking, then sauté scallops, turning over once, until bacon is browned and scallops are opaque, about 5 minutes total. Transfer to a plate and serve with Port reduction for dipping. If you do in fact have to substitute sea scallops for the bay scallops, remember to cut them down to a smaller size! On the same note, before you cut your bacon in thirds, check that the length will be enough to go around the entire circumference of the scallop. Otherwise you will not have bacon-wrapped scallops so much as scallops with a bolero jacket (see photo). When making the reduction this last time around, the Port simply refused to ignite, and I gave up after five tries. It made no noticeable difference to the reduction, so don’t get too hung up on this step. When cooking the scallops, don’t be afraid of the heat! Also, make sure to pat your scallops as dry as possible — this will help you get that nice golden sear.